The need for car repair can be sudden, and we all know how stressful unexpected expenses can be. While there is no magic bullet to keep your car from needing costly repairs, there are some things you can do to help mitigate the expense. Having an experienced, trusted mechanic shop you know you can rely on for accuracy is the place to start with any type of auto repair or maintenance. Of course, that trusted relationship has to start somewhere. If you don’t already have that in place, ask around. Find out who your neighbors trust in the area. Go online and check out reviews. Ineffective auto repair can wind up costing much more when you have to take your car to someone else, because the first mechanic did not fix the problem, or because the “fix” does more damage than good. Experience is the key in finding a quality mechanic. While you’re doing that initial research on a good place to take your vehicle, call the likely candidates and ask what their hourly repair rate is. These rates can range from $70 to $130-plus per hour. While it may seem like a reasonable assumption to go with the least expensive hourly rate you can find, bargain-shopping for car repair requires more discernment than simply finding the cheapest place. Auto repair shops that charge the lowest, also pay their employees the lowest rates. Low pay only attracts technicians who have little experience. It also encourages high turnover. This is not a formula for quality car repair. Another concern with the very low end of the cost scale is dealing with an out-of-date facility that will not have the equipment necessary to preform some types of diagnostics and repair. The cheap shop may also purchase low-end parts that do not come with standard warranties. The general options for places to take your car are the dealership, chain repair shops, and independently-owned locations. Dealerships tend to cost the most. A chain is often on the lower end of the price scale, and independent shops tend to fall in the middle. Independent repair shops often have mechanics who are experienced in a large range of makes and models, so ask around if you have a less common vehicle. A last word of advice about the cheapest end of mechanic shops: Car shops that are so cheap they have a very low profit margin will be the first to try and push services you don’t need. Oftentimes, in these cases, the owner pressures the technicians to meet a certain quota of repairs per customer, or to up-sell where it’s not necessary. Auto repair shops have pretty substantial overhead costs, if individual repair costs are super low, they have to make up the money one way or another. Avoid being one of the customers who fronts that difference. When looking for affordable car care, remember that paying less for inexperienced labor, an out of date facility, and second-rate parts will cost more down the road if the repair fails. Find a balance between trusted, experienced professionals and an hourly rate you can live with. Once you have narrowed down the place where you’ll take your car for diagnostics and repair, make sure you get a written estimate before any work is done. Without an estimate in writing, it is your word against the shop’s if they end up charging much more than you were verbally quoted. A detailed written estimate will give you all the information you need to understand the problem with your vehicle. If the estimate seems unreasonable or is simply a large chunk of change, feel free to get an estimate with at least one other shop. Just like with a medical diagnosis, it never hurts to get a second opinion. Seeing the check-engine light come on or having some other unmistakable issues pop up may send you running into denial. Some people prefer the ignore-it-and-it-will-go-away strategy to car repair. This is a formula for disaster. There are many car repair issues that, when they arise, are not that big of a deal. However, given time without any type of fix, they quickly grow into a much larger—and much more expensive—problem. Some examples of car issues that can get much worse if not repaired quickly are things like brakes, CV joints, and wheel bearings. Letting your brakes squeak on and on, without replacing the pads is not only dangerous, it will lead to warping the rotors. Replacing the rotors along with the pads is much more costly than the pads alone would have been. Others examples include CV joint lubricant or wheel bearing grease. These small problems are simple, relatively inexpensive fixes, yet they both lead to much more extensive damage if not taken care of right away. Getting your car in fast once you suspect a problem is one of the best ways to save on the cost of repairs. Just like with your personal health, keeping your car in good running condition is the best way to avoid the need for repairs. Similar to avoiding a problem once it becomes apparent, some folks push out car maintenance as long as they can. Things like leaks, thick, dirty oil, and clogged filters make your car work harder. That amounts to more wear, which increases the likelihood that something will wear out. Getting a tune up from a reputable mechanic covers a large range of items that are inspected. The technician will look for anything that is showing signs of stress so it can be replaced before it causes a problem. The repair shop also has knowledge of when your make and model is due for its manufacturer’s recommended replacements. These preventative costs are generally a drop in the bucket compared to letting parts wear out and turn into a repair. Once you find a mechanic shop you trust, continue to bring your car there for preventative maintenance. You will be told when you need what done. Stick to the time frames you are given, and get fluids changed and part replacements on schedule. This is truly the best way to get the most for your money from your car. 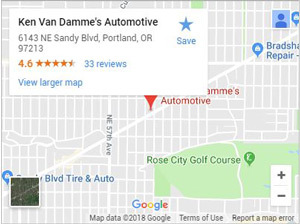 Talk to us about your needs for car repair in Portland.